This is for technical reasons, so that Ctrl + Alt always open the selection (context) menu! 1.) ... Problem Ctrl and Alt key! 2.) ... Function keys Problem! 1.) Problem Ctrl and Alt key! Problem is Ctrl and Alt key! 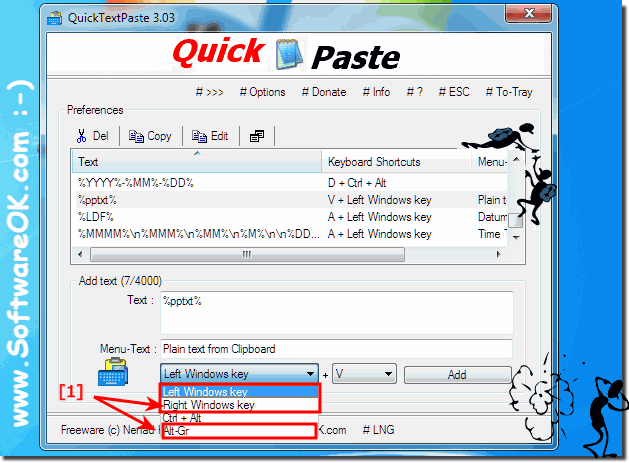 QuickTextPaste works as known via the Windows clipboard, and most programs do not respond, at the pressed Alt and / or Ctrl that as known used for functions such as Copy Ctrl + C, CTRL + V, and so on Alt key as a menu command, etc. However, if you use one of the other three options (... see Image-1 Arrow-1) , and only one instruction per hotkey, the command will be executed without the context menu. (Image-1) QuickTextPaste commands without context menu! That's because function keys are themselves a key combination! You can define/use different/other key combinations in QTP! QuickTextPaste - FAQ-14: Always when I insert via Ctrl + Alt, i see the context menu, why?